The good-looking and affordable Bladez Jet upright exercise bike is ideal as an indoor spin bike for women and men in the 5'2" to 5'10" height range. The Bladez Jet upright exercise bike features a 31-lb (14 Kg) flywheel, an oversized steel frame, transport wheels for easy storage, and a water bottle holder. UPDATE: The Jet exercise bike has been discontinued. You can check out the entire current Bladez bike lineup here. 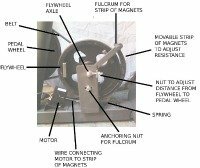 The resistance control knob on the Bladez Jet upright bike has markings so you can quickly find your favorite setting from among the 12 resistance levels. The handlebars adjust up and down as well as in pitch, and the anatomically designed saddle adjusts fore and aft, as well as in height, to achieve that perfect fit. Several online retailers are posting that the exercise bike has a max user weight of 300 lbs, but that is an error: the user capacity is no more than 220 pounds. The excellent reviews and comments on the Bladez Jet are a testament to its outstanding quality and flexibility. The standard saddle, pedals, and handlebars are fine as is, or you can switch them out with components more to your liking, such as better quality SPD compatible pedals. 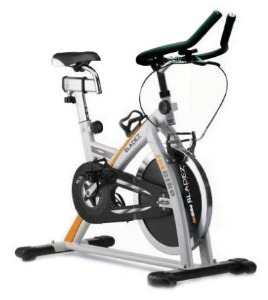 The Bladez Jet upright exercise bike is priced from $599 to $650 and rates a Good Buy. Its 31-lb flywheel is a bit smaller than other spin bikes offer, but this is still one of the top bikes that you should consider at this price point. 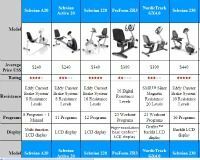 Other models to review include the Fitness Master X Series Momentum (44-lb flywheel) and the Lifespan S2 (40-lb flywheel). In fact, if you are a smaller female, you might be more comfortable pedaling on the Bladez Jet as its 31-pound flywheel will be less stressful on your hips and joints.